Local author Daniel Kalla will be joining us to read from his most recent novel Rising Sun, Falling Shadow, and discuss his dual career as an emergency room physician and writer. 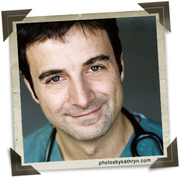 Daniel Kalla produces engrossing novels with an intensity that matches the challenge of his other role as Department Head of Emergency Medicine at an urban teaching hospital in Vancouver. His first five novels, medical thrillers, focus on themes that lie at the heart of his professional life, delving into topics as diverse as superbugs, pandemics, addiction, DNA evidence and patient abuse. His seventh novel, The Far Side Of The Sky, is a historical novel set against a startling, yet little known, chapter of the Second World War, when 20,000 Jews fled Germany to find shelter in only one city: Shanghai, “The Paris of the East”. His latest, Rising Sun, Falling Shadow, continues the story - A story of espionage, betrayal, and one family’s struggle to survive in war-torn Shanghai. Daniel Kalla is currently considered a "single author." If one or more works are by a distinct, homonymous authors, go ahead and split the author. Daniel Kalla is composed of 2 names. You can examine and separate out names.